Make A Fashion Statement In This Winter! Winter is knocking at the doors so outfits of winters have come in your closet. And for a daily wear, we can’t have the outfits in the large amount as the women clothing of winter are little expensive so putting all of our salaries into the winter wear is not a good option. So thinking logically, we have to do mix and match with our old outfits. But how to mix and match those apparels in your daily use to make a fashion statement is the big question coming in your mind. So today we have come with the solution for this. 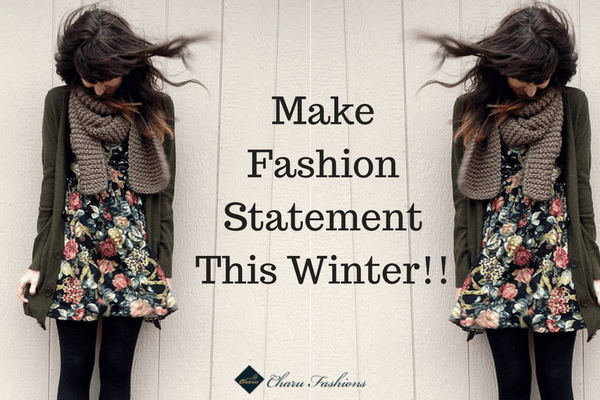 Scroll down to have some ideas about making a fashion statement in this winter without much wastage of money! Pair an old tee with pullover and jacket (long or short depending on your choice) and combine them with your Bottoms. Bottoms can be any of these: jeans, legging or leather pants. In footwear, use boots. Knee high boots or ankle boots both can do a wonder so you can wear any of these boots. Now finish your look with the Crochet Scarves. And you are all done to rock the world with your stunning looks. Knee Length dress with knee-high boots and a long jacket or even a cropped blazer will add the stars to your personality. You can also apply scarf on it depending on your choice. Accessorize yourself with clutch or handbag and get the catchy look. So like this, you can use the same boots, jackets and even scarfs with different styles and in this way you can make a fashion statement in this winter and that too in less budget!